Smart devices just made history and it might be time you (and your site) were responsive to it. Something happened recently to the Internet and it happened quietly. You may not have noticed, but you may have been a part of it. Have you shopped recently using your phone or tablet? If you have, then you just helped make Internet history. Because, according to measurement firm comScore, 55% of all time spent with online retail was done using a mobile device. So now more than half of internet users are looking at your site with a smart phone or tablet. The question is: How do you respond to this? The answer: be responsive. 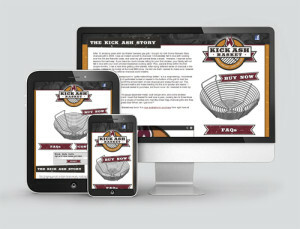 More to the point make your website responsive; not just to users, but to what they are using. What are we talking about? Well, your website loads into smart phones and tablets (a question we get constantly is about the already grown market of smart devices to look at their websites). How good does your website work on smart phones? For years the answer has been mobile versions of sites, which aren’t bad. But the new reality is described in one word: responsive. What does “responsive” mean when it comes to websites? Essentially, it means your site will detect what device it is loading onto and it will respond to that device. For example, if it is loading on to a specific smart phone, the site may not load certain graphic elements so the site loads faster. And that is the end result, sites load faster on to the specific device it is interacting with. Faster load s means happier users and ultimately, happier customers. The other element is how it looks. The responsive site will load into the tablet with fluid viewing dimensions for the user to see. Essentially this means the site will load to the size of the screen it is displayed; making the user experience that much better. Why is this important? As a business owner, we don’t have to tell you the need for making your product accessible to half of your customers. It might be time to update your site. Now over half the Internet now looks at your site with their phones. Something you should be responsive to.